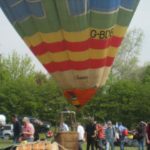 The British Balloon & Museum Inflation day takes place on a fixed day every two years so the weather isn’t exactly guaranteed! Despite this the Old and Rusty mob are no fair weather fliers and will, within reason, always give it a go. The chosen day, May 7th 2016, couldn’t have been better. Blue skies, calm winds all day and happy campers said it all. We trotted off to get some of the action and cop a balloon or two in the traditional manner complete with my new dog, just to see how she got on with hordes of balloons. How well did it go? By the end of the day it was reckoned over a hundred inflations took place. Not bad. They’re still talking about it now and me dog, despite being on a lead, didn’t give a monkeys’. 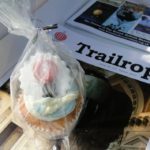 Tim Turner did a bit of a write up that we’ve nicked from ‘Trailrope’, the BBM&L’s esteemed journal. Fan on! 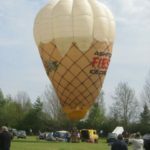 Inflation Day, and the weather really was the cream topping to make it a perfect event! I cannot remember such an impeccable forecast during the preceding week and actually turning out as predicted on the day. The only complaint I received was, ‘It’s too hot!’ I think I can live with that one and it was good for the bottled water companies, but contrary to popular belief, really, I don’t have any control over the weather! Over 90 balloons of all shapes and sizes, including a good selection of special shapes, emerged from their slumber for the event, some not having seen the light of day for many, many years! It was a privilege to have hosted the many pilots and their hardworking crews along with over 450 visitors, who came along to enjoy a day-long festival of colour, mixed with holey, dusty and smelly balloons. Why do we do it? Because we love ballooning. As is traditional there were some fantastic cakes made by the Museum’s accountant Angela Lickorish, a lot of hard work there! Much of the planning of the event takes place many months in advance, coming to a head 24 hours before the big day, with the moving of the selected 25 Museum onto the trailer. The advanced commitment contributing to one big team effort to bring a successful event on the day is greatly appreciated! 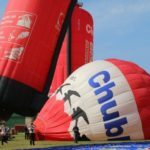 Pete Bish took a back seat this year, that must be a first, due to travelling to the Far East but he still managed to attend and do some inflations. It was left to me to do the introduction briefing and prize giving! As always the categories decided were ‘off the cuff’ and decided on the day. This year was more difficult than normal as there was so much hard work going on with many, many inflations by a number of inflation teams. So, after much ‘head scratching’ the successful recipients were eventually settled as follows. The furthest travelled UK pilot with a balloon went to Roger Bucklandwho turned up with Jackson (G-BEJA) all the way from Aberdeenshire, which nicely matched the Union Jack flag design of the Museum’s Jumpin’ Jack (G-BAIR), its appearance set up by Mark Stelling! 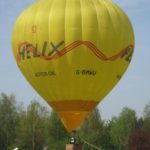 The oldest non BBM&L Balloon present was Jester (G-AXJB) registered on 9th July 1969, now that is old and now in the care of Colin Butter. Bob Garnett (with G-BBGR) was a front runner for this prize until Jester made a late appearance so second place went to Bob this time round. I’ve been ‘nagging’ Colin to come to an Inflation event for a number of years, mainly to bring G-ICES, a Museum balloon, along, and not only did he participate this year but went one better with some other fantastic old balloons. Big thanks then to Colin. The Collective Most Hard Working Team Award went to The Museum Team. 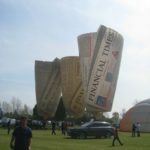 With too many to name they were chosen, not just for a large number of inflations, but the co-ordinating the likes of the line-ups of the Chubbs, Financial Times and the manufacturers ‘firsts’ to name but a few, and also for distributing balloons to others who were kindly offering inflations! 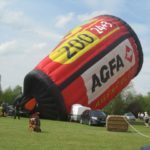 The LAASi Enthusiasts Most Wanted Balloon award selected by David Seex’s team went to Flying Fantasy, or Black Knight (G-BNMI) inflated by Richard Gahan who received the bottle, although Trev Reed and Austin Higginbottom were part of the successful team making the balloon available! A very welcome and wanted balloon to attend thank you all. Aside from the tipple David also added a years’ membership to LAASi, as an additional prize. Greatly appreciated David thank you. 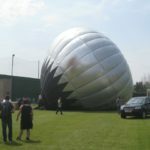 The well deserved ‘Good Egg’ pilot of the day went to Steve Roake who contacted the Museum prior to the event and said he would bring a ‘bottom end’ and inflate what-ever we wanted him to! Taking him at his word we ‘threw’ many balloons at Steve during the day, and as the sun set he was still ‘nagging’ me for more envelopes. Steve you are a star many thank yous! European Representation got rewarded. As ever Christoff Deyaert encouraged a ‘gang of friends’ to attend with various balloons which were more than welcome! John WijGaard, from Joure also received a balloon photograph book, in Dutch (donated by JB Books), for the furthest travelled from the continent! 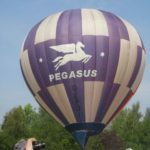 Part of the Museum’s policy, where appropriate, is to restore old balloons so they can continue to be seen and appreciated in years to come, so an enjoyable, but unknown, surprise to myself was the restoration, to inflatable condition, of the first Colting 56A SE-ZYN donated by Per Lindstrand a couple of years ago. 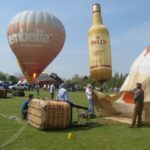 The repairs were crafted by John Yarrow of Easy Balloons, Chris Dunkley’s chief balloon repairer! What a fantastic job John has done after the balloon’s accident in Sweden it was in rather a sorry state. Great work John and Chris, and I won’t forget the scheming that went on to keep it back from my knowledge and creating the surprise at Inflation. I think it was the only time I stood still for longer than a few minutes, only because I was told to. Well done all! When John Crawford, my weather man, went on holiday to New Zealand in April, I asked him to ‘bottle’ some nice weather and bring it back for Inflation Day. I think we can say it certainly worked. Please keep the bottle safe JC and we will use again it in 2018! As ever a big, big thank you to David Hopkins for hosting us for the fourth time and and making everyone feel so welcome. Luckily he doesn’t seem to get fed up of our company! Tim Turner, Event Co-Ordinator.